This article is about the manufacturing process. For other uses of the term, see Casting (disambiguation). 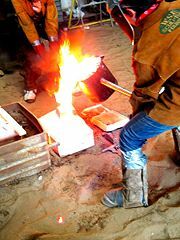 Casting may be used to create artistic sculptures. Casting is a manufacturing process by which a molten material such as metal or plastic is introduced into a mold, allowed to solidify within the mold, and then ejected or broken out to make a fabricated part. Casting is used for making parts of complex shape that would be difficult or uneconomical to make by other methods (such as cutting from solid material). It has been used for over 5,000 years to create art and tools. The earliest casting was a copper frog dating back to 3200 B.C.E., cast in Mesopotamia. Today, it is used all over the world for everything from making huge tools to small artworks such as jewelry. In the future, casting may be used for even things not metal. One purpose that is being tested now is using a mold to create an artificial heart valve. Instead of using plastic, though, they are using live human cells in a mixture of resin to make a living valve. Casting may be used to form hot, liquid metals or meltable plastics (called thermoplastics), or various materials that cold set after mixing of components such as certain plastic resins (e.g. epoxy), water setting materials such as concrete or plaster, and materials that become liquid or paste when moist such as clay, which when dry enough to be rigid is removed from the mold, further dried, and fired in a kiln. Substitution is always a factor in deciding whether other techniques should be used instead of casting. Alternatives include parts that can be stamped out on a punch press or deep-drawn, forged, items that can be manufactured by extrusion or by cold-bending, and parts that can be made from highly active metals. Casting iron in a sand mold. The oldest preserved cast parts – weapons and cult objects made of copper – originate from the Middle East and India. They date back to the period around 3,000 B.C.E. It is possible that metal casting technology, using molds originated in the Middle East. However, there are suggestions that this process may have been developed in India and China. The melting ovens of the early Iron Age can partly be traced back to ceramic burning ovens. The model and mold building was mastered very well from the beginning. Lost moulds made of loam and clay, wax models, single piece-work as well as permanent moulds made of stone and metal for the serial production of casting parts were already used. The production of hollow spaces by using cores, has already been proved by the oldest casting parts discovered. After the great performances in the field of metal casting during antiquity, it took a long time to match the former level in the occidental Middle Ages. However, whereas there is hardly any continuous documentation about casting technology during the antiquity, the German monk Thophilus already examined the forming and casting very intensively around 1140 in his treatise On Divers Arts. The “fireworks books” – especially the book by Italian Biringuccio - were written after 1500 C.E. should also be mentioned in this context. Loam, plaster and wax were the most important working materials. Crucible and later flame ovens were available for the melting of copper, tin and lead alloys. Casting by means of forming sand was common for small parts; permanent molds were of great importance for the serial casting of lead and tin materials. In the beginning, the casting of bells and other clerical equipment was the main focus. Relief casting matched the artistic quality of the antique metal casting at the beginning of modern times. Around 1400, gun-barrels and bullets were the first iron cast products in Europe. The forming technology for the barrels corresponded to loam forming by means of templates, already developed for the casting of bronze in the Middle Ages. After the loam forming technology used in the beginning for the serial production of bullets, the use of permanent molds made of cast iron emerged. In the middle of the fifteenth century items such as water pipes and bells were produced from cast iron. The first period of artistic applications for iron casting started in 1500 by producing plates for stoves, ovens, monuments and fountains. The development of new technologies and an increased demand for cast parts gave tremendous impulses to the metal casting industry during the second half of the eighteenth century. The artistic design of iron casts was not only limited to the creation of decorative objects but was also used for the production of machine parts and articles of daily use. From the early beginning to present day, metal casting has been used to create works of art. Expendable mold casting is a generic classification that includes sand, plastic, shell, and investment (lost-wax technique) moldings. This method of mold casting involves the use of temporary, nonreusable molds. Sand casting requires a lead time of days for production at high output rates (1-20 pieces/hr-mold), and is unsurpassed for large-part production. Green (moist) sand has almost no part weight limit, whereas dry sand has a practical part mass limit of 2300-2700 kg. The sand is bonded together using clays (as in green sand) or chemical binders, or polymerized oils. Sand in most operations can be recycled many times and requires little additional input. Preparation of the sand mold is fast and requires a pattern which can "stamp" out the casting template. Typically, sand casting is used for processing low-temperature metals, such as Iron, Copper, Aluminium, Magnesium, and Nickel alloys. Sand casting can also be used for high temp metals where other means would be unpractical. It is by far the oldest and best understood of all techniques. Consequently, automation may easily be adapted to the production process, somewhat less easily to the design and preparation of forms. These forms must satisfy exacting standards as they are the heart of the sand casting process - creating the most obvious necessity for human control. Plaster casting is similar to sand molding except that plaster is substituted for sand. Plaster compound is actually composed of 70-80% gypsum and 20-30% strengthener and water. Generally, the form takes less than a week to prepare, after which a production rate of 1-10 units/hr-mold is achieved with items as massive as 45 kg and as small as 30 g with very high surface resolution and fine tolerances. Once used and cracked away, normal plaster cannot easily be recast. Plaster casting is normally used for nonferrous metals such as aluminium-, zinc-, or copper-based alloys. It cannot be used to cast ferrous material because sulfur in gypsum slowly reacts with iron. Prior to mold preparation the pattern is sprayed with a thin film of parting compound to prevent the mold from sticking to the pattern. The unit is shaken so plaster fills the small cavities around the pattern. The form is removed after the plaster sets. Plaster casting represents a step up in sophistication and requires skill. The automatic functions easily are handed over to robots, yet the higher-precision pattern designs required demand even higher levels of direct human assistance. Plaster itself may be cast, as can other chemical setting materials such as concrete or plastic resin - either using single use waste molds, multiple use piece molds, or molds made of flexible material such as latex rubber (which is in turn supported by an exterior mold). When casting plaster or concrete the finished product is, unlike marble, relatively unattractive, lacking in transparency, and so is usually painted, often in ways that give the appearance of metal or stone. Alternatively, the first layers cast may contain colored sand so as to give an appearance of stone. By casting concrete, rather than plaster, it is possible to create sculptures, fountains, or seating for outdoor use. A simulation of high quality marble may be made using certain chemically set plastic resins (for example epoxy or polyester) with powdered stone added for coloration, often with multiple colors worked in. The later is a common means of making attractive washstands, washstand tops and shower stalls, with the skilled working of multiple colors resulting in simulated staining patterns as is often found in natural marble or travertine. Shell molding is also similar to sand molding except that a mixture of sand and 3-6 percent resin holds the grains together. Set-up and production of shell mold patterns takes weeks, after which an output of 5-50 pieces/hr-mold is attainable. Aluminium and magnesium products average about 13.5 kg as a normal limit, but it is possible to cast items in the 45-90 kg range. Shell mold walling varies from 3-10 mm thick, depending on the forming time of the resin. The sand-resin mix can be recycled by burning off the resin at high temperatures. Investment casting (lost-wax process) yields a finely detailed and accurate product, but mechanical properties are not good since the process involves slow cooling. Polystyrene foam is also used in investment casting—see lost-foam casting. After a variable lead time, usually weeks, 1–1000 pieces/hour-mold can be produced in the mass range 2.3–2.7 kg. Items up to 45 kg and as light as 30 g are possible for unit production. The process starts by creating an injection die to the desired specifications. This die will be used to inject wax to create the patterns needed for investment casting. The patterns are attached to a central wax sprue, creating an assembly, or mold. The sprue contains the fill cup where the molten metal will be poured into the assembly. The wax assembly is now dipped multiple times in a ceramic slurry, depending on the shell thickness desired. A layer of fine sand (usually zircon) is added on top of each ceramic layer. This process will be repeated until the desired shell is created. After the shell is created to the specifications desired, the wax must be removed; this is normally achieved using an autoclave. This is where the name "lost-wax process" comes from. This leaves an impression of the desired castings, which will be filled with metal. Before being cast, however, the shells must be heated in a furnace so they do not break during the casting process. Next, the desired metal is poured into the hot ceramic shell. The metal fills each part on the assembly, and the central sprue cavity and fill cup. The individual parts will be removed after the mold cools and the shell is removed. The shell is generally removed with water-blasting, although alternate methods can be used. What remains are the cast metal parts, but they are still attached to the sprue assembly. The individual parts are removed by cold-break (dipping in liquid nitrogen and breaking the parts off with hammer and chisel) or with large cutoff saws. Most investment castings need some degree of post casting machining to remove the sprue and runners, and improve surface finish. Grinding operations are performed to remove the gate. Parts are also inspected to make sure they were cast properly, and if not are either fixed or scrapped. Depending on the investment casting facility and specifications, more finishing work can be done on-site, sub-contracted, or not done at all. Investment casting yields exceedingly fine quality products made of all types of metals. It has special applications in fabricating very high-temperature metals such as alloy steels or stainless steels, especially those which cannot be cast in metal or plaster molds and those which are difficult to machine or work. Investment casting is often used in the aerospace and power generation industries to produce single crystal turbine blade, which exhibit superior creep resistance to equiaxed castings. A combination of slow cooling rates, seed crystals, and an elaborate sprue and runner system referred to as a "pigtail" are used to produce single crystal castings. Nonexpendable mold casting differs from expendable processes in that the mold need not be reformed after each production cycle. This technique includes at least four different methods: permanent, die, centrifugal, and continuous casting. Permanent mold casting (typically for non-ferrous metals) requires a set-up time on the order of weeks to prepare a steel tool, after which production rates of 5-50 pieces/hr-mold are achieved with an upper mass limit of 9 kg per iron alloy item (cf., up to 135 kg for many nonferrous metal parts) and a lower limit of about 0.1 kg. Steel cavities are coated with refractory wash of acetylene soot before processing to allow easy removal of the workpiece and promote longer tool life. Permanent molds have a life which varies depending on maintenance of after which they require refinishing or replacement. Cast parts from a permanent mold generally show 20 percent increase in tensile strength and 30% increase in elongation as compared to the products of sand casting. The only necessary input is the coating applied regularly. Typically, permanent mold casting is used in forming iron-, aluminium-, magnesium-, and copper-based alloys. The process is highly automated. must be very flexible in design; a single die casting may have all the features of a complex assembly. If several machining operations would be required or assembly of several parts would be required (to make a finished part), die casting is probably far more economical. This level of versatility has placed die castings among the highest volume products made in the metalworking industry. Common metals used in die casting include zinc and aluminum. These are usually not pure metals; rather are alloys which have better physical characteristics. In recent years, injection-molded plastic parts have replaced some die castings because they are usually cheaper (and lighter—important especially for automotive parts since the fuel-economy standards). Plastic parts are practical (particularly now that plating of plastics has become possible) if hardness is not required and if parts can be redesigned to have the necessary strength. There are four major steps in the die casting process. First, the mold is sprayed with lubricant and closed. The lubricant both helps control the temperature of the die and it also assists in the removal of the casting. Molten metal is then injected into the die under high pressure. The high pressure assures a casting as precise and as smooth as the mold. Once the cavity is filled then the pressure is maintained until the casting has become solid (though this period is usually made short as possible by water cooling the mold). Finally, the die is opened and the casting is ejected. Equally important as high-pressure injection is high-speed injection—required so the entire cavity fills before any part of the casting solidifies. In this way, discontinuities (spoiling the finish and even weakening the casting) are avoided even if the design requires difficult-to-fill very thin sections. Before the cycle can be started the die must be installed in the die casting machine (set up) and brought to operating temperature. This set-up requires 1-2 hours after which a cycle can take anywhere between a few seconds to a few minutes depending on the size of the casting. Maximum mass limits for magnesium, zinc, and aluminium parts are roughly 4.5 kg, 18 kg, and 45 kg, respectively. A typical die set will last 500,000 shots during its lifetime with lifetime being heavily influenced by the melting temperature of the metal or alloy being used. Aluminum and its alloys typically shorten die life due to the high temperature of the liquid metal resulting in deterioration of the steel mold cavities. Molds for die casting zinc last almost indefinitely due to the lower temperature of the zinc. Molds for die casting brass are the shortest-lived of all. This is despite, in all cases, making the mold cavities out of the finest "hot work"alloy steel available. A shot occurs every time the die is filled with metal. Shots are different from castings because there can be multiple cavities in a die, yielding multiple castings per shot. Also the shot consists not only of the individual castings but also the "scrap" (which, unlike in the case of scrap from machining, is not sold cheaply; it is remelted) that consists of the metal that has hardened in the channels leading into and out of the cavities. This includes, for example, the sprue, runners and overflows. Also there is usually some unplanned-for thin scrap called flash, the result of molds not fitting together tightly. The die must fulfill four primary purposes. First, it must hold molten metal in the shape of the final casting. The die must also provide a path for the molten metal to reach the casting cavity. Third, the die is designed to remove heat from the casting. Finally, a die must be able to eject the solidified casting. Because die sets open and shut along a parting line of the casting, design features such as undercuts cannot be cast without the addition of movable slides in the die set. Otherwise these features must be added (more expensively) by secondary machining operations. Die Casting machines are rated by how much clamping force they can apply. Typical sizes range from 100 to 4,000 tons. Along with size there are two main categories that die casting machines fall into. They are hot chamber machines for zinc and lower melting-point metals, or cold chamber machines for aluminum and higher melting-point metals. A die casting machine automatically opens and closes the mold and injects the liquid metal, all under high pressure and as rapidly as possible, in the case of zinc up to several hundred times an hour. (However the very smallest zinc machines may cycle thousands of time an hour.) Sometimes means are provided to automatically remove the shot and re-cycle the machine. The largest machines are as big as a car. Often there is a secondary operation to separate the castings from the scrap; this is often done using a trim die in a power press or hydraulic press. An older method is separating by hand or by sawing, which case grinding may be necessary to smooth the gate mark where molten metal entered or left the cavity. Finally, a less labor-intensive method is to tumble shots if gates are thin and easily broken. Separation must follow. Most die casters perform other secondary operations to produce features not readily castable. Most common is tapping a hole (to receive a screw). Or the surface may be improved; for example, polishing and buffing. Or plating or painting. In a hot chamber machine the metal is pumped into the die directly from a furnace of molten metal. Cold chamber systems transfer molten metal from the furnace to a shot cylinder. The metal is then pushed through from the cylinder into the die. Centrifugal casting is both gravity- and pressure-independent since it creates its own force feed using a temporary sand mold held in a spinning chamber. Lead time varies with the application. Semi- and true-centrifugal processing permit 30-50 pieces/hr-mold to be produced, with a practical limit for batch processing of approximately 9000 kg total mass with a typical per-item limit of 2.3-4.5 kg. Industrially, the centrifugal casting of railway wheels was an early application of the method developed by German industrial company Krupp and this capability enabled the rapid growth of the enterprise. Continuous casting is a refinement of the casting process for the continuous, high-volume production of metal sections with a constant cross-section. Molten metal is poured into an open-ended, water-cooled copper mold, which allows a 'skin' of solid metal to form over the still-liquid center. The strand, as it is now called, is withdrawn from the mold and passed into a chamber of rollers and water sprays; the rollers support the thin skin of the strand while the sprays remove heat from the strand, gradually solidifying the strand from the outside in. After solidification, predetermined lengths of the strand are cut off by either mechanical shears or travelling oxyacetylene torches and transferred to further forming processes, or to a stockpile. Cast sizes can range from strip (a few millimetres thick by about five metres wide) to billets (90 to 160 mm square) to slabs (1.25 m wide by 230 mm thick). Sometimes, the strand may undergo an initial hot rolling process before being cut. Continuous casting provides better quality product as it allows finer control over the casting process, along with the obvious advantages inherent in a continuous forming process. Metals such as steel, copper and aluminium are continuously cast, with the largest tonnage poured being steel. The rate at which a casting cools affects its microstructure, quality, and properties. The cooling rate is largely controlled by the molding media used for making the mold. When the molten metal is poured into the mold, the cooling down begins. This happens because the heat within the molten metal flows into the relatively cooler parts of the mold. Molding materials transfer heat from the casting into the mold at different rates. For example, some molds made of plaster may transfer heat very slowly, while a mold made entirely of steel would transfer the heat very fast. This cooling down ends with (solidification) where the liquid metal turns to solid metal. At its basic level a foundry may pour a casting without regard to controlling how the casting cools down and the metal freezes within the mold. However, if proper planning is not done the result can be gas porosities and shrink porosities within the casting. To improve the quality of a casting and engineer how it is made, the foundry engineer studies the geometry of the part and plans how the heat removal should be controlled. Where heat should be removed quickly, the engineer will plan the mold to include special heat sinks to the mold, called chills. Fins may also be designed on a casting to extract heat, which are later removed in the cleaning (also called fettling) process. Both methods may be used at local spots in a mold where the heat will be extracted quickly. Where heat should be removed slowly, a riser or some padding may be added to a casting. A riser is an additional larger cast piece which will cool more slowly than the place where is it attached to the casting. Generally speaking, an area of the casting which is cooled quickly will have a fine grain structure and an area which cools slowly will have a coarse grain structure. Like nearly all materials, metal is less dense as a liquid than a solid, and so a casting shrinks as it cools—mostly as it solidifies, but also as the temperature of the solid material drops. Compensation for this natural phenomenon must be considered in two ways. The shrinkage caused by solidification can leave cavities in a casting, weakening it. Risers provide additional material to the casting as it solidifies. The riser (sometimes called a "feeder") is designed to solidify later than the part of the casting to which it is attached. Thus the liquid metal in the riser will flow into the solidifying casting and feed it until the casting is completely solid. In the riser itself there will be a cavity showing where the metal was fed. Risers add cost because some of their material must be removed, by cutting away from the casting which will be shipped to the customer. They are often necessary to produce parts which are free of internal shrinkage voids. Sometimes, to promote directional shrinkage, chills must be used in the mold. A chill is any material which will conduct heat away from the casting more rapidly that the material used for molding. Thus if silica sand is used for molding, a chill may be made of copper, iron, aluminum, graphite, zircon sand, chromite or any other material with the ability to remove heat faster locally from the casting. All castings solidify with progressive solidification but in some designs a chill is used to control the rate and sequence of solidification of the casting. Shrinkage after solidification can be dealt with by using an oversized pattern designed for the relevant alloy. Pattern makers use special "contraction rulers" to make the patterns used by the foundry to make castings to the design size required. These rulers are 1 - 6 percent oversize, depending on the material to be cast. These rulers are mainly referred to by their actual changes to the size. For example a 1/100 ruler would add 1mm to 100mm if measured by a "standard ruler" (hence being called a 1/100 contraction ruler). Using such a ruler during pattern making will ensure an oversize pattern. Thus, the mold is larger also, and when the molten metal solidifies it will shrink and the casting will be the size required by the design, if measured by a standard ruler. A pattern made to match an existing part would be made as follows: First, the existing part would be measured using a standard ruler, then when constructing the pattern, the pattern maker would use a contraction ruler, ensuring that the casting would contract to the correct size. MK Technology. 2007. "History of metal casting." Feinguss/History of Metal Casting. Retrieved February 10, 2007. This page was last modified on 17 January 2017, at 17:17.